As a Mom of young children, it is a rare treat to go out without children in tow. It takes a while to wrap my mind around the fact that I don’t have to take the 3 tote bags loaded with everyone’s drinks, snacks, hats, jackets and forms of entertainment, as is my habit to carry most everywhere I go. I only have to carry what I myself will need: maybe my phone, credit card, ID and some cash. I feel light as a feather! I feel as if I could walk on clouds. 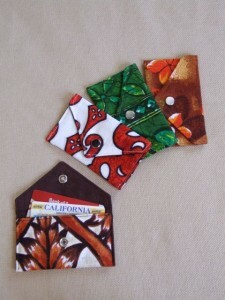 I designed these little wallets for those who, like me, enjoy the chance to travel light. With my phone in one coat pocket and my little card wallet in the other, my shoulders don’t know what to do without their constant burden. Maybe I am a couple inches taller even. 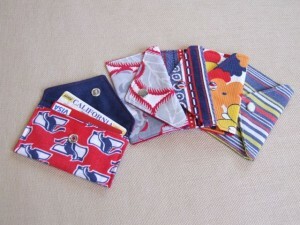 I also love the chance to use so many different, fun fabrics. 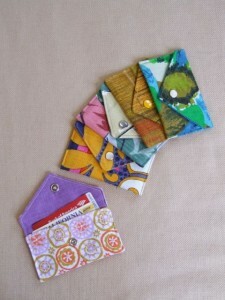 Even a small vintage orphan scrap can have a life as one of these cute little wallets. I even got to use the fun snaps I have been collecting here and there. Feasting my eyes on these little morsels gives me a great sense of satisfaction. 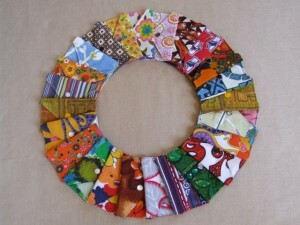 Rescued and unwanted fabrics occupy a fleeting vision of order in my otherwise cluttered and scattered mind. Really cute!! My card holders are on their last legs, being held together with rubber bands. Maybe Santa will notice my plight.